A father and two mothers of three girls, aged eleven to thirteen years old, filed criminal complaints for child abuse and buying or engaging the services of a trafficked person for prostitution against Guiragos Tarakjian, an 86 year old Lebanese national. Handel Sarabosing, a tourist car driver, married who hails from Barangay Biking, Dauis, Bohol was also charged with child abuse and qualified human trafficking of a child. Tarakjian and Sarabosing were collared by a four-man National Bureau of Investigation – Bohol District Office (NBI-BDO) team in a hot pursuit operation on Wednesday evening, April 10, 2019. Sarabosing fell into the custody of the NBI with the coordination of the Tagbilaran City Police in the vicinity of the St. Joseph Cathedral at 7:30 PM while Tarakjian, in coordination with the Bohol Tropics Resort management was arrested an hour later in room 777 where he was billeted. The criminal complaints were immediately filed before the Office of the City Prosecutor in Tagbilaran City on Thursday, April 11, 2019, a day after the incident by Allan Pangyarihan, Joanna Loraine Lapasaran, and Emelly Balo, parents of the victims and residents of Purok 3, Barangay Tawala, Panglao. 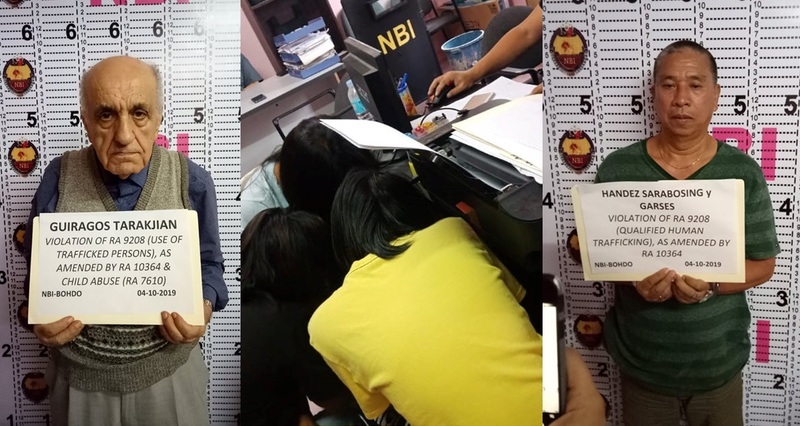 The NBI-BDO team headed by Special Investigator (SI) Froilan Casian Grageda, SI James Paul Suello, Agents Glenn Damasing and Levi Anthony Royeras also executed a joint affidavit of arrest in support of the filing of criminal charges against Tarakjian and Sarabosing. The lurid incident broke into the news when Atty. Rennan Augustus T. Oliva, Agent-in-Charge of the NBI-BDO was interviewed over DYRD “Inyong Alagad” on Thursday to validate reports that an Arab and a tourist van driver were detained at the NBI office for alleged child abuse of three minor females. Oliva confirmed that an Arab who was later identified as a Lebanese with postal address at Baalbeck, Lebanon, and Sarabosing, known in the community as a basketball stalwart of the University of the Visayas Green Lancers during his heydays were now under NBI custody. 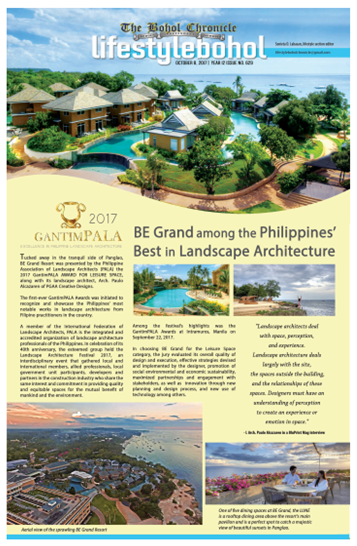 The acts of Sarabosing, the movement of the minors and the vicinity of the room of Tarakjian were captured by closed-circuit television (CCTV) cameras strategically located in the premises of Bohol Tropics Hotel. Acting swiftly on the complaint lodged by the parents of the three minors hours after the incident, the NBI immediately conducted an entrapment operation that led to a hot pursuit after the CCTV footages were validated. Footages showed the arrival of the orange colored Toyota Vios car driven by Sarabosing together with the three girls alighting and entering the room of Tarakjian, the departure of Sarabosing and the two girls to BQ Mall, the sudden return of the car to fetch the girl left with Tarakjian and a footage showing the girl leaving the room of the Lebanese and boarding the car driven by Sarabosing heading for Panglao. The parents of the victims immediately sought the assistance of the NBI-BDO after one of the girls, a 13-year-old confided to her mother that she was molested by Tarakjian inside room 777 of the Bohol Tropics Resort. According to a four-page sworn statement by one of the girls who caught the fancy of Tarakjian, the driver of the car who took them to the Bohol Tropics approached his uncle to look for good looking girls to entertain his foreign guest. Since they were at their uncle’s house, the driver allegedly said: “Mao ni manguyog? Ok raman kay mga hitsuraan.” (Are they the ones who will accompany? It’s alright. They are all good looking). When the girls were inside the car, they were told by the driver to entertain the foreigner by allowing him to touch them. They were also warned not to tell anyone anything that the foreigner will do to them so as not to alarm their parents, according to the victim’s statement. When they arrived at the resort hotel, they were told by the driver to get inside the room and were served sandwiches while the foreigner looked them over. According to the victim, the foreigner became agitated when I resisted, refuse to undress and said “no” then he called the driver to get me out of the room. The driver took the girl outside and admonished her “for the lost opportunity and waste of fuel” then drove the three of them back to Panglao and gave her Php200.00 which I did not accept but instead, he put the money on my lap. The 13-year-old told Special Investigator James Paul Suello that she could identify and recognize the foreigner and the driver that was involved in the incident. The two other girls with ages 11 and 12 years old narrated the same circumstances leading to their encounter with the foreigner and the driver saying that their parents told them to accompany a foreigner who will buy us things in the mall and go swimming because he likes children as his companions. Since one of the complainants, who is also a tourist driver knew Sarabosing and were easily enticed by the unexpected goodwill allowed their daughters to go along with him to meet his Lebanese friend. In the course of the investigation, the NBI learned that Tarakjian instructed Sarabosing his preference for girls 15 years old and below. According to the NBI, the Lebanese arrived in the Philippines on April 5, 2019 and was a frequent visitor to Bohol since 2011. The parents of the victims also executed a two-page joint affidavit-complaint accusing Tarakjian and Sarabosing of Child Abuse under Republic Act (RA) 7610 known as Special Protection of Children against Abuse, Exploitation and Discrimination Act. Criminal charges were also filed against Sarabosing for Qualified Human Trafficking under RA 9208 as amended by RA 10364.